Experimental investigations of the neural substrate of consciousness typically take one of two paths, studying (1) contents or (2) levels of consciousness. It seems obvious to most that these two “paths” are interrelated, yet much less obvious how. This paper gives one suggestion to grasp the interrelation, arguing that conscious levels are determined by conscious contents in a very specific way. It follows from the argument that conscious contents are so-called natural kinds, whereas conscious levels are not. It is commonly agreed, and commonly mentioned in papers like this one, that consciousness yet has no widely accepted definition. Operationally, however, most seem to agree that a distinction between the contents of consciousness and an overall level of consciousness makes sense (Hohwy, 2009). Whereas typical examples of contents of consciousness include “the taste of coffee,” “feelings of pain,” or “the experience of redness,” typical examples of levels of consciousness are coma or the vegetative state, sleep, or drug abuse. In the empirical literature, the investigation of consciousness often amounts to a study of neural correlates of consciousness. Thus, the distinction between the two “types” or “aspects” of consciousness just mentioned, is operationalized as a search for two “types” of neural correlates (or NCCs) – as two interrelated yet independent areas of research. In spite of distinctions, researchers preoccupied with any of the two “types” typically agree on one crucial thing: Seemingly, we get to know that we are conscious, and that there is anything such as consciousness in the first place, by way of introspection. For example, Naccache (2006, p. 1396) states that “consciousness is univocally probed in humans through the subject’s report of his or her own mental states.” This paper is about the meaning of the term “level of consciousness” and its relation to contents. Introspection has been defined as a directing of attention toward one’s own experience, different from directing it toward external objects (Overgaard and Sørensen, 2004; Overgaard et al., 2006). Whereas one may disagree on the exact wording of such a definition, it is a wide-spread understanding that there is no independent objective method by way of which we have access to the contents of consciousness. Introspective (or, at least, subjective) access seems to be the single method by which we may conduct empirical consciousness research. Were we, someday, to find one particular physical event so strongly associated with consciousness that the latter never would appear without the first, we would still not have access to such objective methods. To arrive at such an association, one would have to conduct several experiments in order to correlate a physical event with consciousness – using introspecting experimental participants. Consequently, this method would not be independent of introspection but carry with it the strengths, weaknesses and limitations held by introspection, as the physical event would relate to no more and no less than its subjective counterpart of the correlation. Assuming that we necessarily come to know about our own conscious experiences by way of introspection, we would also be inclined to believe that the differentiation between, say, different contents of consciousness happens in the same act of introspection. If a neuroscientist aims to find the neural correlates of the conscious experience of being happy, her experiments might contrast measures of brain activity in subjects reporting experiences of happiness with measures of activity when reporting experiences of other emotions. However, she may also decide that “happiness” in itself comprises several different emotions. By introspection, her own or her subjects’, she may have increased insight into different appearances of happiness, and she may target these differences in new experiments. In this way, theories of neural correlates to different subjective states are shaped by introspection in the scientific process. In the two “domains” of research, studying contents and levels of consciousness, there seems to be different answers to the question whether consciousness is gradual or “all-or-none.” Several recent experiments give empirical support to the idea that consciousness is gradual (e.g., Kouider et al., 2010). 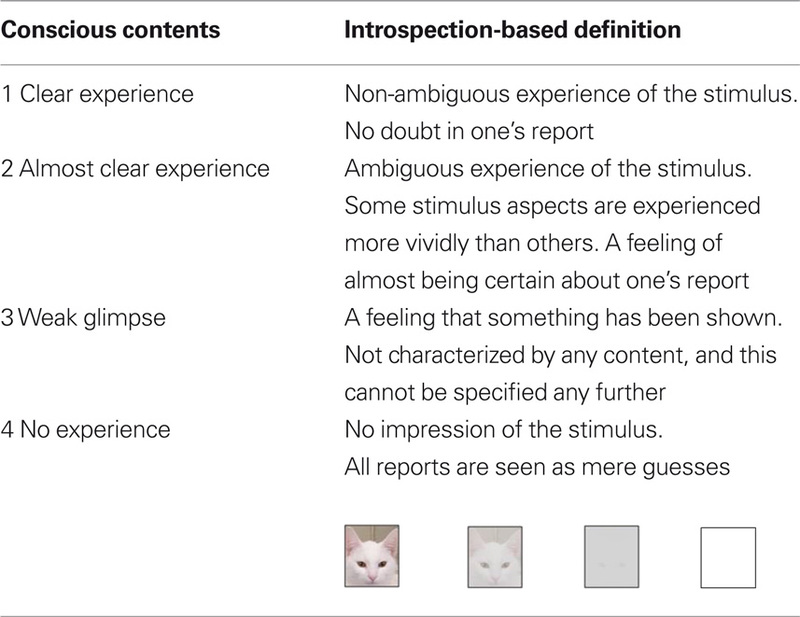 Ramsøy and Overgaard (2004) have asked subjects directly about the clearness of their visual experiences and have repeatedly found (Overgaard et al., 2004, 2008) that they tend to report experiences as being graded rather than “all-or-none.” Given the assumptions above that knowledge about consciousness is based on introspective access, it would be a better procedure to trust subjective reports. In the study of levels of consciousness, there is much less disagreement. Here, three distinct “stages” of degraded consciousness have been described – coma, the vegetative state (VS), and the minimal conscious state (MCS). Interestingly, the differentiation between the stages is based on behavioral criteria. VS patients are generally thought to differ from comatose patients as VS patients can be aroused, yet both groups are believed to be fully unconscious (Schiff, 2005). MCS patients, however, are believed to have “some” or “fluctuating” consciousness (Machado and Korein, 2009). Other patients with severe brain injury who, however, are not in MCS, are typically believed to be “more conscious,” yet in some cases “less conscious” than healthy people. Consciousness is thus considered gradual and not necessarily stable. Here, however, we have no introspective evidence to support this widely accepted idea. Given our previous assumption that introspection is the sine qua non to know about the presence, absence or character of a given state of consciousness, and, furthermore, since the idea that conscious contents may be degraded derives from and is defended by introspection, there is a need to study introspection in this context as well. Imagining a degraded level of consciousness seems however immensely more difficult than imagining degraded content of consciousness. For instance, when imagining being in VS or just trying to remember what it is like being nearly asleep, all suggestions seem to amount to a changed, or degraded, content of consciousness. Considering the above mentioned point of departure that knowledge about consciousness derives from introspection, this is in and of itself a problem for the conception of the study of levels of consciousness as an independent area of research, distinct from the study of contents of consciousness. How could we make sense of “degraded levels of consciousness”? One possible conception would be that a subject in a degraded level of consciousness has fewer possible contents than subjects in a less degraded level. This, however, seems not to be the way, the concept is intended to work. Say you were to decide whether you or a severely brain injured patient is more conscious1. In principle, you could try and “count” how many experiences each of you could have, yet this seems futile, and, according to the here presented view, beside the point. Instead, it would be important to know what the experienced content is like to each of you. Were the patient only able to entertain very “basic” experiences such as hunger, thirst or pain, yet had these experiences just as clear and vividly as you, you could of course claim to be conscious of more than the patient. Yet, could you, as a person, claim to be more conscious that the patient? We believe not. Levels of consciousness seem tied to the “clearness” or “vividness” of contents. If you, close to sleep or in a hypnotic state, experience everything more blurry and vague, without the kind of clarity known from full wakefulness, the notion of degraded levels of consciousness seems applicable. With regards to the contents of consciousness, subjects seem able to distinguish between different degrees over time in a consistent manner. According to PAS, subjects tend to agree that conscious perception can be subdivided in four degrees as shown in Table 1: As either fully conscious, two degrees of “degraded” consciousness, or not conscious at all. Table 1. The response categories, created by participants in the Ramsøy and Overgaard (2004) experiment. The figures below intend to illustrate how the categories refer to a still “less clear” image. According to the subjects’ own reports, and consistent with the behavioral results, a “lower degree” of conscious content is experienced as being overall more “blurry” and/or vague (e.g., Overgaard et al., 2008). With regards to levels of consciousness, things are, again, more tricky. It is here much less obvious how to distinguish between different degrees, in spite of the reference to contents, as you at any given level of consciousness (except, of course, in its total absence) may experience a large number of different contents. For instance, if one at the same time entertained 26 degraded contents and 3 fully conscious ones, would that person be said to be in a degraded level? In order to be consistent with the above line of reasoning, one should conclude that this is not the case. If the number of contents has no role in the categorization of or distinction between levels, clearly, it cannot be the factor by which to decide whether a given individual is conscious at a specific level. A more obvious and consistent option would be to argue that the “most clearly” experienced contents determines the present level of consciousness. In this way, a VS patient unable to experience most events consciously, with a few degraded experiences, but with a preserved ability to experience, say, pain as clearly as any healthy subject, this patient would be conceived of as being fully conscious. In the same way (and assuming that PAS is a reasonable way to grade conscious content), an individual experiencing a “weak glimpse” as the most clear experience, would be conscious at a corresponding level 3. As shown in Table 2, the consequence of this logic is a strong and necessary tie between conscious levels and conscious contents, in such a way that the first is determined by the latter. Furthermore, given our premises that consciousness is a subjective phenomenon, and that our only knowledge of its existence is this subjective knowledge, we have “direct introspective evidence” about contents of consciousness – but no direct evidence about levels of consciousness. The level, as argued, is determined solely on the basis of contents. Table 2. The relationship between categories of conscious contents and conscious levels. Another consequence, equally controversial, would be that conscious level should be determined using subjective rather than behavioral measures. Whereas this is obviously difficult in non-communicating subjects, some recent experiments have collected evidence with the purpose of making arguments about the presence of conscious experiences in VS patients (Owen et al., 2006). Furthermore, increased insight into neural substrates and mechanisms involved in conscious content, would theoretically make it possible to investigate the presence of conscious experiences in non-communicating subjects indirectly. In conclusion, we have here argued that research in conscious levels and contents cannot be carried out separately as conclusions about the level depend in a very direct way on conclusions about content. Furthermore, we have put forward the view, as a consequence of the line of argumentation, that behavioral methods are of no greater value to determine conscious level than to determine conscious contents. This work was supported by a Starting Grant, European Research Council. ^This is just an example to illustrate the point. Obviously, the argument could have been made with other species, infants, etc. Kouider, S., Gardelle, V., Sackur, J., and Dupoux, E. (2010). How rich is consciousness? Trends Cogn. Sci. 14, 301–307. Machado, C., and Korein, J. (2009). Persistant vegetative and minimal conscious states. Rev. Neurosci. 20, 203–220. Naccache, L. (2006). Is she conscious? Science 313, 1395–1396. Overgaard, M., Fehl, K., Mouridsen, K., and Cleeremans, A. (2008). Seeing without seeing? Degraded conscious vision in a blindsight patient. PLoS ONE 3, 1–4. doi: 10.1371/journal.pone.0003028. Overgaard, M., Nielsen, J. F., and Fuglsang-Frederiksen, A. (2004). A TMS study of the ventral projection streams from V1 with implications for the finding of neural correlates of consciousness. Brain Cogn. 54, 58–64. Overgaard, M., Rote, J., Mouridsen, K., and Ramsøy, T. Z. (2006). Is conscious perception gradual or dichotomous? A comparison of report methodologies during a visual task. Conscious. Cogn. 15, 700–708. Overgaard, M., and Sørensen, T. A. (2004). Introspection distinct from first order experiences. J. Conscious. Stud. 11, 77–95. Owen, A. M., Coleman, M. R., Boly, M., Davis, M. H., Laureys, S., and Pickard, J. (2006). Detecting awareness in the vegetative state. Science 313, 1402. Ramsøy, T. Z., and Overgaard, M. (2004). Introspection and subliminal perception. Phenomenol. Cogn. Sci. 3, 1–23. Schiff, N. D. (2005). Modeling the minimally conscious state: measurements of brain function and therapeutic possibilities. Prog. Brain Res. 150, 473–493. Copyright: © 2010 Overgaard and Overgaard. This is an open-access article subject to an exclusive license agreement between the authors and the Frontiers Research Foundation, which permits unrestricted use, distribution, and reproduction in any medium, provided the original authors and source are credited.